Now President Trump wants to kick off a new infrastructure project and spend a trillion dollars, about twice the cost of the Interstate Highway system. He plans to fund the projects with tax credits and public-private partnerships. 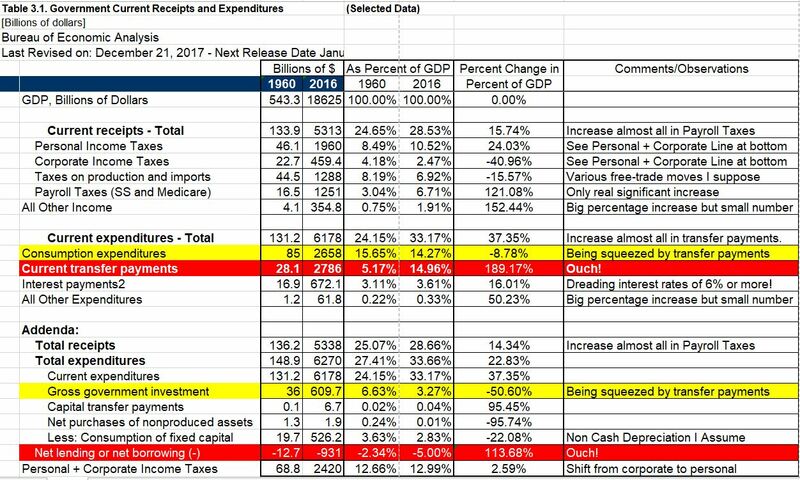 I know it is hard to know what anybody is really thinking in Washington, but according to one article, he actually proposes spending $20B per year for the next ten years and hopes that will inspire states and cities to spend an additional $800B in the following years. Read more about it here: Hope is a wonderful thing. About a year ago leading Democrats rolled out a ten year trillion dollar infrastructure plan to be funded by federal spending, but we haven’t heard much about it lately. It looks like the stage is set for a big fight against President Trump’s rather modest and not very helpful proposal. I just hope that if something is approved, it does not degenerate into a bunch of smelly pork barrel projects. Hope again! Way back in 2014, President Obama proposed a $478B infrastructure bill paid for with increased corporate tax revenues, but the Senate was having nothing to do with that. Everybody wants infrastructure, but nobody wants to pay for it. Why do we hear so much talk and see no action? The problem is that we can’t afford a truly transformational investment in infrastructure. We are already $20.6T in debt, not even counting the unfunded liabilities, and are continuing to borrow about $700B per year just to keep things running. The red lines in the chart are the big problems, and the yellow lines are the symptoms. I know it is complicated and can’t be read on a phone. So, if you don’t have time to digest the chart, here it is in a nutshell: Social benefit transfer payments were only 5% of GDP in 1960 and are now 15% of GDP. And, it’s not on this chart, but debt as a percent of GDP was about half what it is now and GDP growth in the sixties was about twice what it is now. Those are very significant differences. We were so wealthy that only five years after the Highway project was announced, President Kennedy was able to announce on May 25th, 1961, plans to put a man on the moon before the end of the decade! It cost about $175B in today’s dollars and was accomplished in 1969. Hey, that’s an idea. Why don’t we borrow from the Social Security Trust Fund to pay for a big infrastructure project? What? There is nothing there? It has already been borrowed and spent? Oh well. Back to the drawing board. Here are the data, straight from the Bureau of Economic Analysis. All this reminds me of a much smaller federally funded infrastructure project from the 1930’s. There needs to be a Gee Whiz factor if you aim high. Roads like the Pennsylvania Turnpike across the USA is a Gee Whiz. Going to the Moon is a Gee Whiz. Fixing old, tired bridges is not a Gee Whiz. No idea what would be a genuine Gee Whiz today (certainly not switching our electrical system to expensive and intermittent generation sources or expecting all automobiles to be electric with the same power grid, and that unreliable renewable generation). Johnson tried War on Poverty. Did not work. Nixon tried War on Cancer. Did not work. Obama wanted Shovel Ready. Did not work. Building a border wall is not a Gee Whiz. And, Going to Mars is probably also not a Gee Whiz. Filling potholes won’t get it either. Maybe a dome over the USA with good climate control inside? Maybe a cross country transportation alley with self driving lanes for autos and for freight trucks and super fast train all running side by side. I’m thinking maybe a half mile wide. Would have to be a lot of twists and turns though to get it situated in ways to benefit all the senators and congressmen and thereby earn their votes. Forget it. How about developing and then providing to every American a device (robot or otherwise) that can perform all the paid labor effort for that individual, thus earning a paycheck for that individual. We are on that path anyway, but this would allow everyone to participate, instead of just those with the wealth to purchase and operate such devices. This could even include children, the disabled and the frail elderly, which would make them a productive member of society. As additional upsides, It could eliminate all types of job discrimination, give incredible boosts to productivity and even eliminate most waste and scrap. All while the owner stays home watching reality shows and movies. A utopia that could have a lot of Gee Whiz appeal and support. That would put a whole new slant on HR work…how to recruit and hire and evaluate and pay robots to recruit and hire and evaluate and pay robots to….